Apple fried rice - apple flavored fried rice. 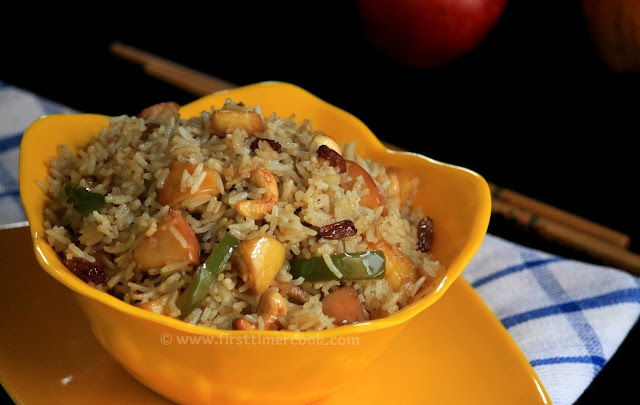 This type of fried rice packs the goodness of nuts as well as apples. So it is not just yummy, it is good for health too. This dish is liked most by the kids. Basically fried rice is a rice dish served in most Chinese banquets as a part of main course meal. In order to make, precooked rice is stir fried along with sauces, some vegetables or non-vegetables (meat,egg). By the times it has become more popular across the world and most chosen restaurant served foods. Also a lot of fusion varieties are seen like Indo-Chinese cuisines, American-Chinese cuisines. 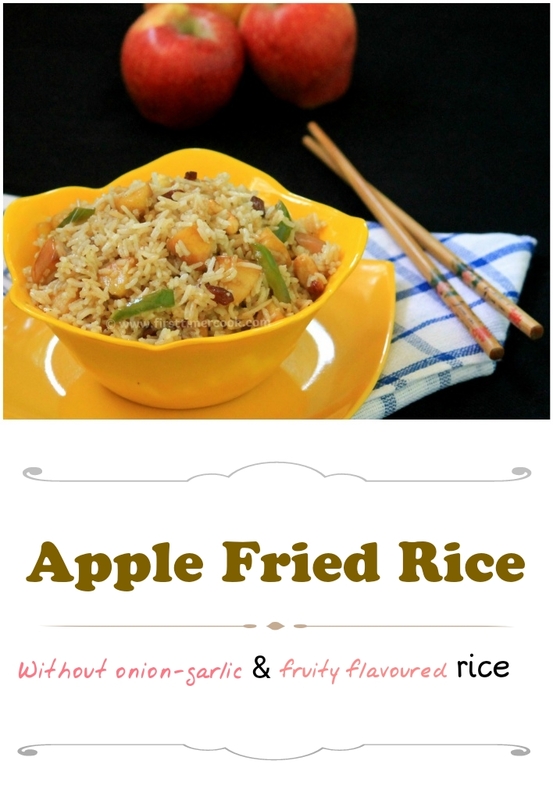 Here I have used fresh and deliciously tasty apple for making this fried rice. 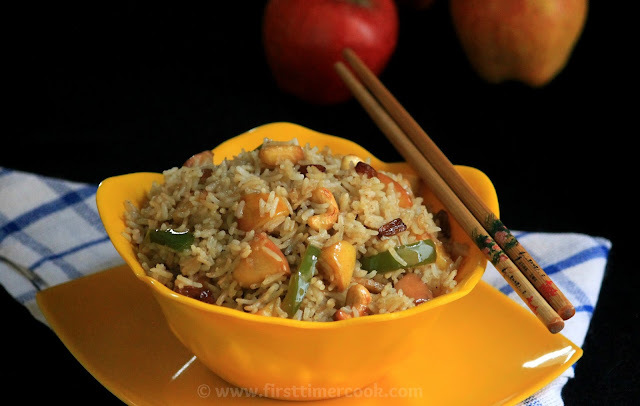 Apple fried rice has a mild sweet flavor along with aroma of ginger. It can be served as it is without any side dish. So below I have listed step by step method of preparation. Soak rice for 25-30 minutes. Then cook the rice with enough water. Once the rice is cooked, spread it on a plate and allow to cool down completely. Heat oil in a pan. Add the cashews, raisins and fry them till golden. Take out from oil and set aside. To the same pan, add shredded ginger. Saute till a nice aroma come out. Add capsicum, sprinkle little salt and fry till they are half cooked on high flame. Then add apple, soya sauce and sugar. Within 1-2 minutes, the apples'll release a nice aroma. Do not over fry the apples. Add the cooked rice, fried cashews and raisins, pepper powder. Mix gently everything without breaking any rice grain in high flame for a minute. Reduce the flame and fry for 2-3 minutes more. Finally switch of the flame. 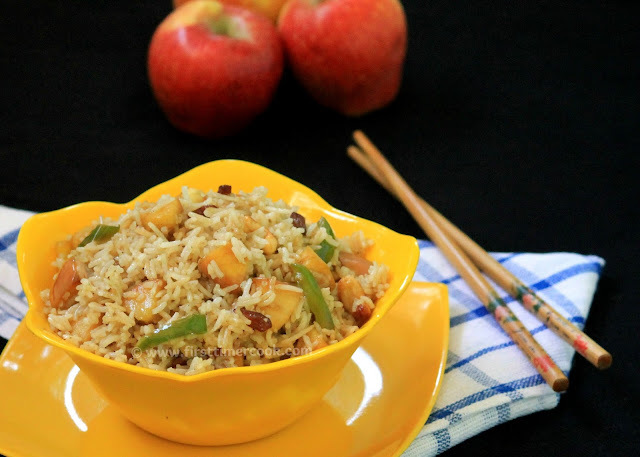 Serve and enjoy the apple fried rice with sweet apple bites ! Choose fresh and deliciously tasty apple for a good aromatic apple fried rice. For any type of fried rice, always prefer to use rice that has been cooked in advance and cooled thoroughly.